The untimely and unexpected death of actor Luke Perry of a massive stroke is a tragic reminder of the devastating ability of stroke to affect anyone at any age. According to the Centers for Disease Control and Prevention, each year more than 795,000 Americans suffer a stroke. Of that number, 140,000 will die making stokes responsible for about 1 in 20 deaths in the U.S. and the fifth leading cause of death among Americans. When a person is having a stroke, minutes can literally mean the difference between life and death. That’s why the quicker you recognize the symptoms of stroke, the quicker you can get them the help they need to save their life and lower complications. As one of the leading causes of death in the U.S. and the number one cause of adult disability, half of all Americans have at least one key risk factor for suffering a stroke. These risk factors include high blood pressure, high cholesterol, diabetes, atrial fibrillation, and smoking. Just like when a person has a heart attack, there is a sense of urgency on the part of family to get their loved one to the hospital as quickly as possible to receive emergency care. 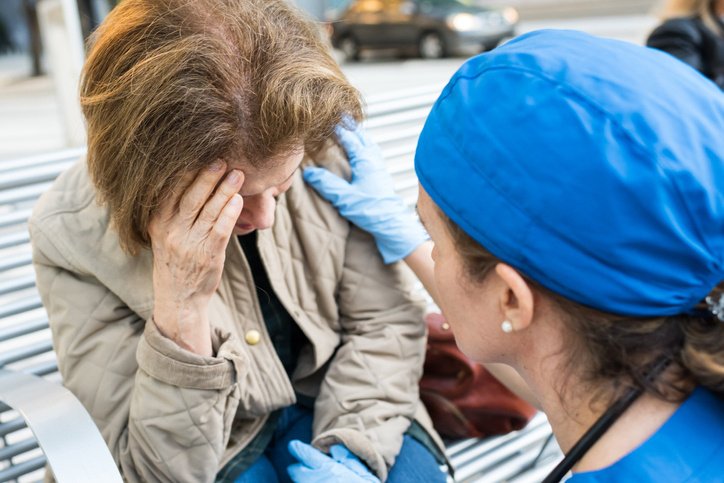 The same type of urgency needs to be enacted when a person has a stroke to greatly reduce permanent damage to the brain that can result in significant disability or death. A stroke occurs when the blood supply to the brain is interrupted. Brain cells are deprived of oxygen-rich blood will die, causing damage to the brain. There are two kinds of stroke, ischemic and hemorrhagic. An ischemic stroke occurs when a blood vessel in the brain is blocked by a clot, restricting blood flow to part of the brain. A hemorrhagic stroke occurs when a blood vessel is the brain ruptures due to a weakness in the wall of the vessel, resulting in bleeding inside of the brain. F – FACE – Ask the person to smile. Does one side of the face droop? Stroke can cause deterioration in the muscles of the face. A – ARMS – Ask the person to raise both arms. Does one arm drift downward? Weakness may be on one side of the body. S – SPEECH – Ask the person to repeat a simple phrase such as “the sky is blue.” Is their speech slurred or strange? Speech is often affected by slurring of words or having difficulty finding the correct words expressing themselves or call objects by the wrong name. Why is time of the essence in getting treatment? When a person has a stroke, think of it as a “brain attack” and time is of the essence as time progresses so does the stroke. When brain cells are deprived of oxygen, every minute counts as these cells will begin to die and the result can be permanent brain damage or death. The optimal window for treating a stroke is typically 3 to 4.5 hours. That’s because clot-busting medication known as a tissue plasminogen activator (TPA) is most effective when given as soon as possible. Any delay in treatment raises the risk of complications. Most stroke victims who call 911 arrive at a hospital and receive medication within three hours as opposed to less than half of those who don’t use emergency medical services. Many of the people who chose not to use emergency medical services either didn’t want to be bothered or didn’t recognize the severity of their symptoms. A person can have stroke-like symptoms that may signal a transient ischemic stroke attack or TIA, sometimes referred to as a “mini-stroke.” Like an ischemic stroke, TIAs occur when a clot blocks blood supply to the brain but the blockage is brief and there is no permanent damage. Keep in mind also, just because symptoms go away doesn’t mean a person is in the clear. There is a good chance it could turn into a full stroke within a day to a week so anyone experiencing symptoms of a stroke need to be treated right away. Regardless of what type of stroke a person may have, treatment is needed as soon as possible. There is only a small window of opportunity for treatment and if symptoms are not recognized or there is a delay in getting treatment, then the consequences could end up being long term. · Keep blood pressure in check by exercising, eating healthy and if needed, use medication. · Reduce intake of cholesterol and saturated fat in the diet. Doing so can reduce the plaque buildup in the arteries. · Maintain a healthy body weight. Being overweight contributes to other stroke risk factors, such as high blood pressure, cardiovascular disease and diabetes. · Anyone who has already had a stroke, may be recommended by their doctor to take medication to prevent having another.